TSPSC TRT 2017 SA(School Assistant) Teachers Recruitment Notification, Online Applications, vacancies, eligibility. 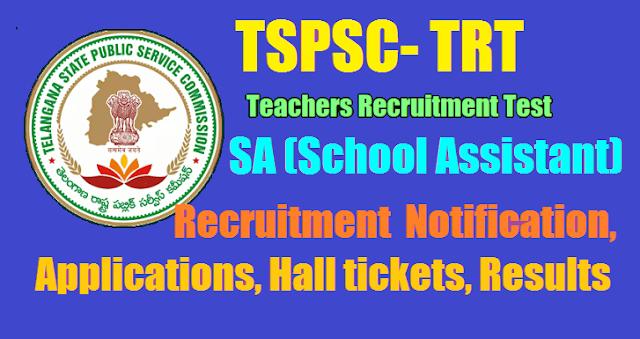 TSPSC SA(School Assistant) Teachers Recruitment Test(TRT) 2017 Notification/ TSPSC Teachers Recruitment Test/TS TRT/TS DSC Exam dates, Last date to apply: TSPSC SA(School Assistant) Teachers Recruitment Test(TRT), TSPSC SA(School Assistant) Teachers Recruitment Test Online application form, TSPSC SA(School Assistant) Teachers Recruitment Test Hall tickets, TSPSC SA(School Assistant) Teachers Recruitment Exam date, TSPSC SA(School Assistant) Teachers Recruitment Exam Results, Selection list Results, Certificates Verification Dates, TSPSC SA(School Assistant) Teachers Recruitment Test Main Exam dates, TSPSC SA(School Assistant) Teachers Recruitment Test Preliminary Exam Results, TSPSC TRT SA(School Assistant) Main Exam Results, Main Exam Preliminary key, Final Key, TSPSC TRT(TS DSC) SA(School Assistant) Notification, TSPSC SA(School Assistant) Teachers Recruitment test Schedule, TSPSC SA(School Assistant) Teachers Recruitment Information Bulletin, TSPSC SA(School Assistant) Teachers Recruitment Eligibility Criteria/ Post wise Qualifications, How to Apply-Apply online-User Guide for TSPSC SA(School Assistant) Teachers Recruitment test, Exam pattern, Syllabus Structure and Content for TSPSC SA(School Assistant) Teachers Recruitment Test, District wise and Category Posts Wise SA(School Assistant) Teacher Posts Vacancies for TSPSC SA(School Assistant) Teachers Recruitment test, TSPSC SA(School Assistant) Teachers Posts Direct Recruitment(Scheme of Selection) Rules, 2017 and more details to be available on TSPSC Web portal. TSPSC Notification No. 52/2017 Dt. 21/10/2017 Teacher Recruitment Test In School Education Department School Assistant. : Applications are invited Online from qualified candidates through the proforma Application to be made available on Commission’s WEBSITE (www.tspsc.gov.in) to the post of School Assistant in School Education Department. EDUCATIONAL QUALIFICATIONS: Applicants must possess the qualifications from a recognized University/ Institution as detailed below or equivalent thereto, as specified in G.O.Ms.No.25 School Education (General) Dept., Dt.10/10/2017 as on the Date of Notification. 1 School Assistant (Mathematics ) i) Must possess a Graduate / Post Graduate Degree in Mathematics (or its allied subjects as given in the Annexure-A) from a University recognised by UGC with 50% marks in either Graduation or Post Graduation (In case of SC / ST / BC / Differently abled candidates, the minimum marks shall be 45%) and Pass in Bachelor of Education (B.Ed.) course with Mathematics as a Methodology subject from any institution recognised by NCTE OR ii) Must possess a 4-year B.A.B.Ed. / B.Sc.B.Ed. Integrated degree, with at least 50% marks (In case of SC / ST / BC / Differently abled candidates, the minimum marks shall be 45%) with the Mathematics as a Methodology from any institution recognised by NCTE.AND Pass in Paper II of Telangana State Teacher Eligibility Test (TSTET) / Andhra Pradesh Teacher Eligibility Test (APTET) / Central Teacher Eligibility Test (CTET) with Mathematics and Science as Optional. 2 School Assistant (Physical Science) i) Must possess a Graduate's Degree with any two of the following subjects as optionals i.e. Physics (or its allied subjects as given in the Annexure-A) and Chemistry (or its allied subjects as given in the Annexure-A) from a University recognised by UGC with 50% marks in either Graduation or Post Graduation (In case of SC / ST / BC / Differently abled candidates, the minimum marks shall be 45%) and Pass in Bachelor of Education (B.Ed.) course with Physical Science / Physics / Chemistry / Science as a Methodology subject from any institution recognised by NCTE. (Candidates who study one of the two optionals at Graduation and the other at Post Graduation with the required percentage or also eligible for the post) OR ii) Must possess a 4-year B.A.B.Ed. / B.Sc.B.Ed. Integrated degree with at least 50% marks (In case of SC / ST / BC / Differently abled candidates, the minimum marks shall be 45%) with the Physical Science / Physics / Chemistry / Science as a Methodology from any institution recognised by NCTE. AND Pass in Paper II of Telangana State Teacher Eligibility Test (TSTET) / Andhra Pradesh Teacher Eligibility Test (APTET) / Central Teacher Eligibility Test (CTET) with Mathematics and Science as Optional. 3 School Assistant (Biological Science) i) Must possess a Graduate's Degree with any two of the following subjects as optionals i.e. Botany (or its allied subjects as given in the Annexure-A) and Zoology (or its allied subjects as given in the Annexure-A) from a University recognised by UGC with 50% marks in either Graduation or Post Graduation (In case of SC / ST / BC / Differently abled candidates, the minimum marks shall be 45%) and Pass in Bachelor of Education (B.Ed.) course with Biological Science / Natural Sciences / Science / Botany / Zoology as a Methodology subject from any institution recognised by NCTE. (Candidates who study one of the two optionals at Graduation and the other at Post Graduation with the required percentage are also eligible for the post) OR ii) Must possess a 4-year B.A.B.Ed. / B.Sc.B.Ed. Integrated degree with at least 50% marks (In case of SC / ST / BC / Differently abled candidates, the minimum marks shall be 45%) with the Biological Science/ Natural Sciences / Science / Botany / Zoology as a Methodology from any institution recognised by NCTE. AND Pass in Paper II of Telangana State Teacher Eligibility Test (TSTET) / Andhra Pradesh Teacher Eligibility Test (APTET) / Central Teacher eligibility Test (CTET) with Mathematics and Science as optional. 4 School Assistant (Social Studies) i) Must possess a Graduate's Degree with any two of the following subjects as optionals i.e. History (or its allied subjects as given in the Annexure-A) / Economics (or its allied subjects as given in the Annexure-A) / Geography (or its allied subjects as given in the Annexure-A) / Political Science or Politics (or its allied subjects as given in the Annexure-A) / Public Administration (or its allied subjects as given in the Annexure-A) / Sociology (or its allied subjects as given in the Annexure-A) / Psychology (or its allied subjects as given in the Annexure-A) / Philosophy / Commerce (or its allied subjects as given in the Annexure-A) as optional from a University recognised by UGC with 50% marks in either Graduation or Post Graduation (In case of SC / ST / BC / Differently abled candidates, the minimum marks shall be 45%) and Pass in Bachelor of Education (B.Ed.) course with Social Studies / Social Sciences / Geography / History / Politics / Political Science / Economics as a Methodology subject from any institution recognised by NCTE. (Candidates who study one of the two optionals at Graduation and the other at Post Graduation with the required percentage are also eligible for the post) OR ii) Must possess a 4-year B.A.B.Ed. / B.Sc.B.Ed. Integrated degree with at least 50% marks (In case of SC / ST / BC / Differently abled candidates, the minimum marks shall be 45%) with the Social Studies / Social Sciences / Geography / History / Politics / Political Science / Economics as a Methodology from any institution recognised by NCTE.AND Pass in Paper II of Telangana State Teacher Eligibility Test (TSTET) / Andhra Pradesh Teacher Eligibility Test (APTET) / Central Teacher Eligibility Test (CTET) with Social Studies as Optional. 5 School Assistant (English) i) Must possess Graduation with English as one of the Optional / Graduation in Literature in English / Post Graduation Degree in English from a University recognised by UGC with 50% (In case of SC / ST / BC / Differently abled candidates, the minimum marks shall be 45%) and Pass in Bachelor of Education (B.Ed.) course with English as a Methodology subject from any institution recognised by NCTE. OR ii) Must possess 4-year B.A.B.Ed / B.Sc.B.Ed. Integrated degree with at least 50% marks (In case of SC / ST / BC / Differently abled candidates, the minimum marks shall be 45%) with English as a Methodology from any institution recognised by NCTE. AND Pass in Paper II of Telangana State Teacher Eligibility Test (TSTET) / Andhra Pradesh Teacher Eligibility Test (APTET) / Central Teacher Eligibility Test (CTET) with i. Mathematics and Science or ii. Social Studies as Optional. 6 School Assistant (Telugu) i) Must possess Graduation with Telugu as one of the Optional / Graduation in Literature in Telugu / Bachelor's Degree in Oriental Language (BOL) in Telugu / Post Graduation Degree in Telugu from a University recognised by UGC with 50% (In case of SC / ST / BC / Differently abled candidates, the minimum marks shall be 45%) and Pass in Bachelor of Education (B.Ed.) course with Telugu as a Methodology subject or Language Pandit Training in Telugu from any institution recognised by NCTE. OR ii) Must possess 4-year B.A.B.Ed. / B.Sc.B.Ed. Integrated degree with at least 50% marks (In case of SC / ST / BC / Differently abled candidates, the minimum marks shall be 45%) with Telugu as a Methodology from any institution recognised by NCTE. AND Pass in Paper II of Telangana State Teacher Eligibility Test (TSTET) / Andhra Pradesh Teacher Eligibility Test (APTET) / Central Teacher Eligibility Test (CTET) with i. Mathematics and Science or ii. Social Studies as Optional. 7 School Assistant (Hindi) i) Must possess Graduation with Hindi as one of the Optional / Graduation in Literature in Hindi / Bachelor's Degree in Oriental Language (BOL) in Hindi / Post Graduation Degree in Hindi from a University recognised by UGC with 50% (In case of SC / ST / BC / Differently abled candidates, the minimum marks shall be 45%) and Pass in Bachelor of Education (B.Ed.) course with Hindi as a Methodology subject or Language Pandit Training in Hindi or Hindi Shikshan Parangat from any institution recognised by NCTE. OR ii) Must possess 4-year B.A.B.Ed. / B.Sc.B.Ed. Integrated degree with at least 50% marks (In case of SC / ST / BC / Differently abled candidates, the minimum marks shall be 45%) with Hindi as a Methodology from any institution recognised by NCTE. AND Pass in Paper II of Telangana State Teacher Eligibility Test (TSTET) / Andhra Pradesh Teacher Eligibility Test (APTET) / Central Teacher Eligibility Test (CTET) with i. Mathematics and Science or ii. Social Studies as Optional. 8 School Assistant (Urdu) i) Must possess Graduation with Urdu as one of the Optional / Graduation in Literature in Urdu / Bachelor's Degree in Oriental Language (BOL) in Urdu / Post Graduation Degree in Urdu from a University recognised by UGC with 50% (In case of SC / ST / BC / Differently abled candidates, the minimum marks shall be 45%) and Pass in Bachelor of Education (B.Ed.) course with Urdu as a Methodology subject or Language Pandit Training in Urdu from any institution recognised by NCTE. OR ii) Must possess 4-year B.A.B.Ed. / B.Sc.B.Ed. Integrated degree with at least 50% marks (In case of SC / ST / BC / Differently abled candidates, the minimum marks shall be 45%) with Urdu as a Methodology from any institution recognised by NCTE. AND Pass in Paper II of Telangana State Teacher Eligibility Test (TSTET) / Andhra Pradesh Teacher Eligibility Test (APTET) / Central Teacher Eligibility Test (CTET) with i. Mathematics and Science or ii. Social Studies as Optional. 9 School Assistant (Kannada) i) Must possess Graduation with Kannada as one of the Optional / Graduation in Literature in Kannada / Bachelor's Degree in Oriental Language (BOL) in Kannada / Post Graduation Degree in Kannada from a University recognised by UGC with 50% (In case of SC / ST / BC / Differently abled candidates, the minimum marks shall be 45%) and Pass in Bachelor of Education (B.Ed.) course with Kannada as a Methodology subject or Language Pandit Training in Kanada from any institution recognised by NCTE. OR ii) Must possess 4-year B.A.B.Ed. / B.Sc.B.Ed. Integrated degree with at least 50% marks (In case of SC / ST / BC / Differently abled candidates, the minimum marks shall be 45%) with Kannada as a Methodology from any institution recognised by NCTE. AND Pass in Paper II of Telangana State Teacher Eligibility Test (TSTET) / Andhra Pradesh Teacher Eligibility Test (APTET) / Central Teacher Eligibility Test (CTET) with i. Mathematics and Science or ii. Social Studies as Optional. 10 School Assistant (Tamil) i) Must possess Graduation with Tamil as one of the Optional / Graduation in Literature in Tamil / Bachelor's Degree in Oriental Language (BOL) in Tamil / Post Graduation Degree in Tamil from a University recognised by UGC with 50% (In case of SC / ST / BC / Differently abled candidates, the minimum marks shall be 45%) and Pass in Bachelor of Education (B.Ed.) course with Tamil as a Methodology subject or Language Pandit Training in Tamil from any institution recognised by NCTE. OR ii) Must possess 4-year B.A.B.Ed / B.Sc.B.Ed. Integrated degree with at least 50% marks (In case of SC / ST / BC / Differently abled candidates, the minimum marks shall be 45%) with Tamil as a Methodology from any institution recognised by NCTE. AND Pass in Paper II of Telangana State Teacher Eligibility Test (TSTET) / Andhra Pradesh Teacher Eligibility Test (APTET) / Central Teacher Eligibility Test (CTET) with i. Mathematics and Science or ii. Social Studies as Optional. FEE: (Remittance of Fee) Each applicant must pay Rs. 200/- (RUPEES TWO HUNDRED ONLY) towards Online Application Processing Fee, each subject applied for. This apart, the applicants have to pay RS. 80/- (RUPEES EIGHTY ONLY) towards Examination Fee. However, the following category of candidates are exempted from payment of Examination fee. N.B. :- BC’s, SC’s and ST’s belonging to other states are not exempted from payment ofApplication processing Fee and Examination Fee and they are not entitled for any kind of reservation.